You have always heard about colours and elements that have the power to influence the ambience and mood so it’s important that you take this into consideration when you decorate your home. 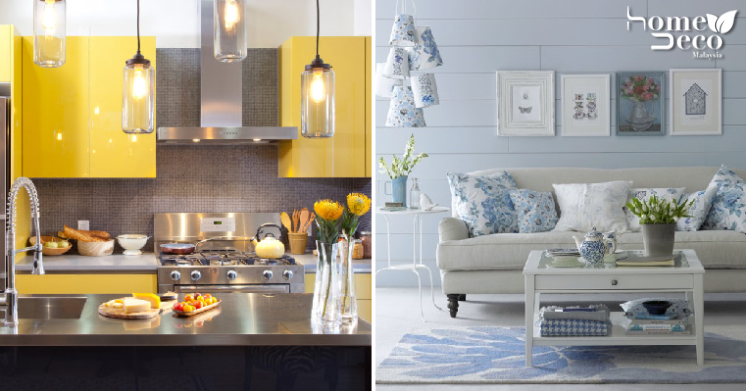 As the home should be a happy and joyful place, here are a few ideas for you to get started. If you need something that will brighten up your kitchen, then this cheerful yellow elements will definitely make your day and put you in a positive mood. The stylish lighting helps to illuminate the place even more. There’s nothing more comforting than creating a homey atmosphere with some baby blues and this pretty floral pattern is exactly what you need. Sprinkle them liberally around the room for a cosy feel and get ready to just lounge around all day in this gorgeous living room. Clearing the clutter and mess from your home will leave you feeling so much lighter and happier so it’s logical to conclude that waking up in this minimalistic bedroom will be a serene and calming experience. This bedroom will ensure that you have the right start to your day when you wake up every morning. It is a well-known fact that having some fresh green plants in your home will brighten it up so go ahead and put your favourite plants inside. Plus, you get fresher air in your home as an added benefit thanks to the plants’ natural respiration process. Having warm and neutral tones is a classic look that will not only look elegant but can help to uplift the mood in your home as well. You can add splashes of colour to keep the area looking interesting while still keeping a comfy and casual atmosphere.